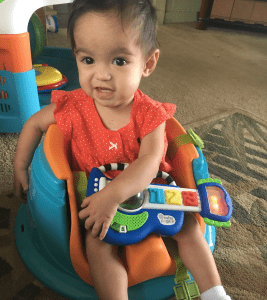 A sweet and bubbly 12 month old, MeleAna was diagnosed with hepatoblastoma, a rare type of liver cancer, this past spring. She currently lives with her mother, Kiley Iona, great-grandmother and 15-year-old uncle. MeleAna’s 22-year-old aunt will soon join the family as well. Needless to say, she is surrounded by love and support. Upon diagnosis, MeleAna immediately underwent multiple courses of chemotherapy. During treatment, she suffered numerous post-operative complications that resulted in tenuous and prolonged hospitalization in the Pediatric Intensive Care Unit at Kapiolani Medical Center. Today, chemotherapy is on hold due to the risk of infection and healing complications. However, MeleAna is doing well and continues to receive outpatient physical therapy, occupational therapy and speech therapy two times per week while the doctors closely monitor her labs. Her treatment center is nearly one hour away from her home, requiring Kiley to commute back and forth on a regular basis. These countless appointments, in addition to the 24-our care MeleAna needs due to feeding issues, have made employment nearly impossible for Kiley at this time. As MeleAna works towards recovery, Kiley feels the financial strain of her daughter’s illness. She spends approximately $250 a month on gas and an additional $150 for miscellaneous expenses relating to MeleAna’s cancer. Recognizing a family in need, MeleAna’s social worker reached out to Family Reach for assistance. We provided financial help that went towards diapers, medicine, gas and other essentials.